Cooper Lighting Lumark® Collection Wide distribution flood light in carbon bronze color, features die-cast aluminum construction with TGIC polyester powder coated finish. Vacuum metalized reflector ensures even light distribution. Flood light uses 85-Watt LED lamp that has voltage rating of 120 - 277-Volts and current rating of 1.105 - 0.556-Amp. Lamp has color rendering index of 70 and color temperature rating of 4397K to ensure optimal light level in the surrounding. Lamp offers 9432-Lumens of bright light output. 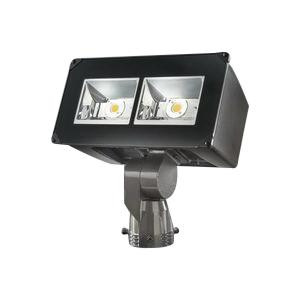 This trunnion mountable flood light measures 15-15/16-Inch x 12-11/16-Inch x 8-11/16-Inch. It has more than 50000 hours of life span. Flood light is ideal for area lighting for security, building facade lighting, accent and signage lighting. It has IP66 rated degree of protection. Flood light is UL/cUL listed.